The First Bess Crawford Mystery! 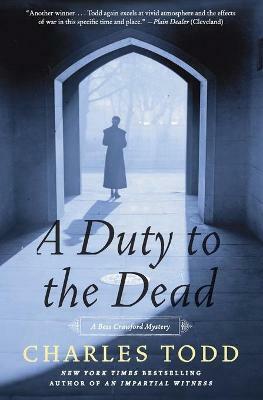 Charles Todd, author of the resoundingly acclaimed Ian Rutledge crime novels ("One of the best historical series being written today" --Washington Post Book World) debuts an exceptional new protagonist, World War I nurse Bess Crawford, in A Duty to the Dead. A gripping tale of perilous obligations and dark family secrets in the shadows of a nightmarish time of global conflict, A Duty to the Dead is rich in suspense, surprise, and the impeccable period atmosphere that has become a Charles Todd trademark. Dedicated to helping the many wounded during the Great War, Bess Crawford receives a desperate request from a dying lieutenant while serving as a nurse aboard a hospital ship. "Tell my brother Jonathan that I lied," the young man says. "I did it for Mother's sake. But it has to be set right." Back home in England, Bess receives an unexpected response from the dead soldier's family, for neither Jonathan Graham' his mother' nor his younger brother admit to understanding what the message means.